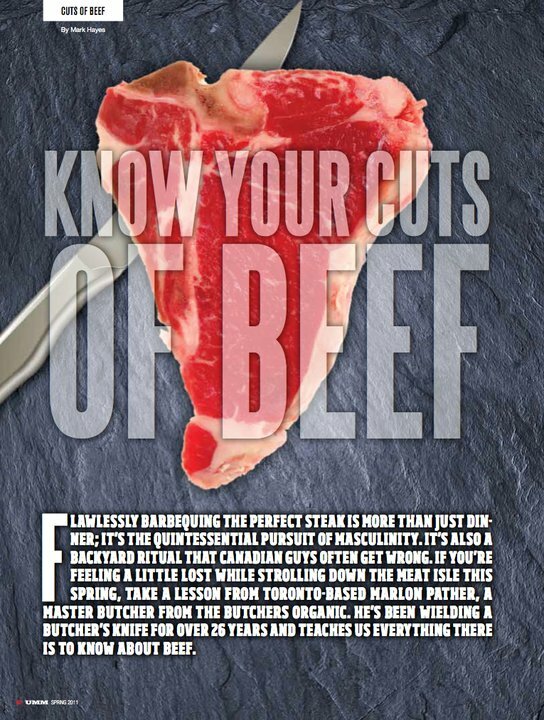 Flawlessly barbecuing the perfect steak is more than just dinner, it’s the quintessential pursuit of masculinity. It’s also a backyard ritual that Canadian guys often get wrong. If you’re feeling a little lost while strolling down the meat isle this spring, take a lesson from Toronto based Marlon Pather, a Master Butcher from The Butchers Organic. Here’s Marlon proudly displaying one of his cuts of meat. This guy has been wielding a butchers knife for over 28 years and is about to teach you everything there is to know about beef. First and foremost, if you’re standing in a grocery store you’re already doing something wrong. 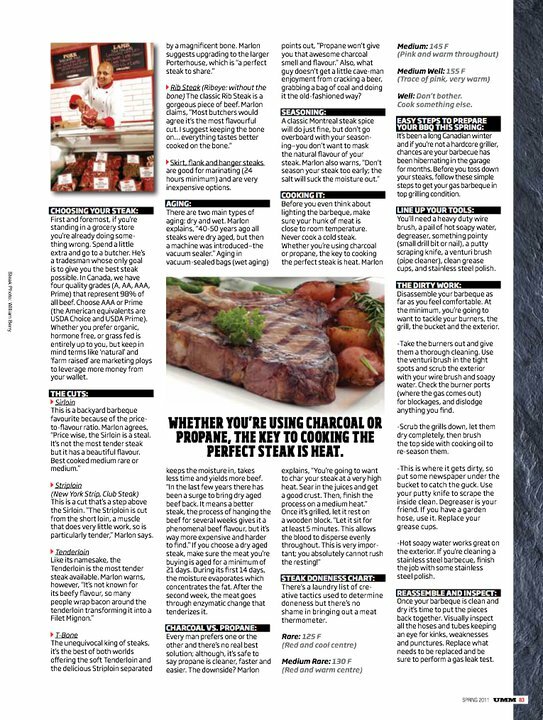 Spend a little extra and go to a butcher, he’s a tradesman whose only goal is to give you the best steak possible. In Canada, we have four quality grades (A, AA, AAA, Prime) that represent 98% of all beef. Choose AAA or Prime (the American equivalents are USDA Choice and USDA Prime). Whether you prefer organic, hormone free, or grass fed is entirely up to you, but keep in mind terms like “natural” and “farm raised” are marketing ploys to leverage more money from your wallet. This is a cut that’s a step above the Sirloin. “The Striploin is cut from the short loin, a muscle that does very little work so is particularly tender,” Marlon says. If you choose a dry aged steak, make sure the meat you’re buying is aged for a minimum of 21 days. During its first 14 days, the moisture evaporates which concentrates the fat. After the second week, the meat goes through enzymatic change that tenderizes it. Every man prefers one or the other and there’s no real best solution; although, it’s safe to say propane is cleaner, faster and easier. The downside? Marlon points out, “Propane won’t give you that awesome charcoal smell and flavour.” Also, what guy doesn’t get a little cave-man enjoyment from cracking a beer, grabbing a bag of coal and doing it the old-fashioned way? There’s a laundry list of creative tactics used to determine doneness but there’s no shame in bringing out a meat thermometer. Well: Don’t bother. Cook something else.